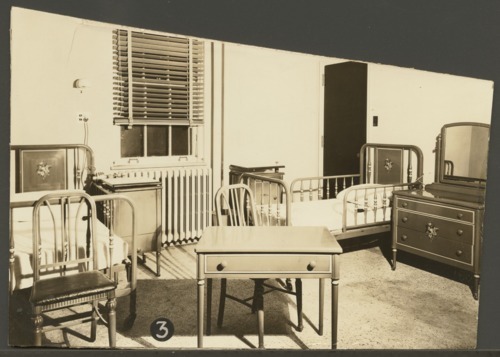 These four photographs show the interior of the hospital built by the Security Benefit Association for its members who paid a nickel a month for hospital care, an orphanage for their children if the member died, and an old folks home when that was necessary. All buildings were centered around a model farm in Topeka, Kansas. One image shows a telephone switchboard and operator. Interior views of the Security Benefit Association hospital in Topeka, Kansas - Patient room, note side rails on bed.